This image taken from Cuban TV shows special operations agents surrounding one of the 21 Cubans who stormed the Mexican Embassy in Havana, March 1, 2002 (Photo: AFP). In declarations tinged with relief and, increasingly, indignation, Cuban government-owned newspapers announced Friday, March 1 that an unarmed special police unit had "liberated" Havana's Mexican Embassy early that morning from the "criminals" and "antisocial elements" who, two days earlier, hijacked a bus and crashed it through the embassy's front gates. Cuban officials blamed the Embassy break-in on a series of radio broadcasts by U.S. government-funded Radio Martí, which had repeated the following statement thoughout the day on Wednesday, Feb. 27: "[Mexican] Foreign Minister Jorge Castañeda reiterated in Miami that the doors of his country's embassy in Havana are open to all Cuban citizens, as is Mexico." According to an official government statement appearing in the Feb. 28 edition of Havana's government-owned Granma, the broadcasts were a malicious distortion of a speech Castañeda had made the previous day while inaugurating the Cultural Institute of Mexico in Miami. "This cultural institute belongs to all Mexicans, all Latin Americans, and, naturally, all Cuban-Americans," Granma quoted Castañeda as saying. Castañeda reportedly then invited Latin American residents of Miami—and Cubans in particular—to consider that institution "their home," adding, "the doors of the Mexican Embassy in Havana are open to all Cuban citizens, as is Mexico." The government communiqué in Granma blasted Radio Martí's broadcasts as "false, perfidious" news and a "gross provocation." Later, Granma reported, Castañeda himself stated that his words "had been taken out of context" by "radical elements" in Miami who "no doubt wanted to use, to distort, my declarations." Radio Martí, which denied the accusations, was established during former U.S. President Ronal Reagan's term to beam news and commentary criticizing Cuban President Fidel Castro at the island, and is operated principally by exiles of Castro's communist government. According to the Cuban government's version of events, by the afternoon of Feb. 27, a few dozen people had gathered outside the Mexican embassy, seemingly in response to the radio announcements. Later that evening, the statement continued, "several apparently coordinated groups" converged in the streets outside the embassy. Minutes later, 21 young men hijacked a public bus, forced out the passengers, and rammed it through the embassy's security gates at full speed. As others in the crowd sought to follow them, violent clashes with police ensued and 150 people were taken into custody. In an apparent effort to calm the situation, Castro appeared outside the embassy soon after police forcefully regained control of the area. He remained at the scene twenty minutes of so, as government supporters chanted "Fidel, Fidel!" to shouts of "Down with Fidel!" from the hijackers on the roof of the Mexican Embassy. Four of the bus hijackers sustained serious injuries as they crashed the bus into the embassy's gates. They were treated by Cuban doctors at the request of Mexican Embassy officials, according to a second government communiqué issued through Granma on March 1 titled "The Type of People Utilized by the Terrorist Mafia in Miami and the U.S. Government." Eager to denounce the embassy occupants, the March 1 communiqué claimed 13 of the 21 had criminal records and confidently stated that "not one of them was motivated by political or ideological objectives." Their convictions range in severity from armed robbery and drug trafficking to "anti-social behavior." Once inside the embassy compound, the 21 would-be emirgrants began demanding exit visas and threatened to hurl themselves off the embassy roof if the police approached. Hours of negotiations between Mexico, Cuba, and the embassy occupants followed, until the Mexican government asked Cuban authorities to intervene. The 21 hijackers were then removed in a pre-dawn operation "using minimal force," reported Cuba's Juventud Rebelde, adding that the operation lasted only six minutes and passed "without incident." The March 2 edition of Granma added another detail. Castro himself, the paper said, had participated in laying the plans to remove the hijackers. On March 2, the Cuban press also relayed a series of statements issued by the Mexican Foreign Ministry, explaining that the men were not granted visas because they never applied for political asylum and could not demonstrate political persecution. Instead, Mexico considered them economic migrants whose real intention was to reach the United States. At a press conference in Havana on March 2, Mexican Ambassador Ricardo Pascoe Pierce told journalists that the 21 "don't seem to us to be the kind of people who could have organized an operation of this kind by themselves," and raised suspicions that there was "some kind of leadership behind it." Ambassador Pascoe Pierce said that only one of the 21 men had actually heard the Radio Martí broadcast, whereas the rest were acting on rumors. But according to one witness—a doctor who requested his name be withheld—people began gathering spontaneously outside the embassy as soon as they heard Mexico was offering exit visas: "I ran down there [to the embassy] as fast as I could and would have run through the gates too, but the police were forcing everybody back and arresting people. I'll do anything to get out of here. Most of my family is already in the United States." The occupation of the Mexican Embassy was not the first time Cuban asylum-seekers had resorted to such desperate measures. For Cuban officials, the incident was a distressing flashback to the events precipitating the 1980 Mariel boatlift, when asylum-seekers used a bus to plow their way into the Peruvian Embassy, killing a guard and prompting President Castro to temporarily ease emigration restrictions. In the following weeks, some 125,000 Cubans left for the United States. But the bus-through-the-gates technique now appears to be exhausted as a way off the island. With the Mexican Embassy situation resolved and Mexico-Cuba relations seemingly bolstered by the incident, an impassioned Fidel Castro warned television audiences Tuesday night, March 5, that "no one who forces their way into an embassy will ever leave Cuba." 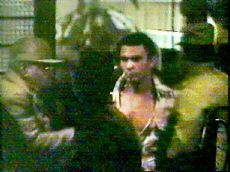 Castro also said that the approximately 150 people who were arrested that night would appear before local tribunals and receive sentences according to the severity of their crimes. He claimed all were "delinquents and lumpens" with prior criminal records, dismissing them as "irresponsible scum" whose behavior justifies the ongoing "colossal effort" to incorporate all members of Cuban society into government social programs. "Not one professional, not one intellectual, not one artist, and not a single university student was among the hijackers," Castro stressed. The embassy incident will surely serve as fodder for the upcoming Geneva Human Rights convention, where both pro- and anti-Cuban government contingents are likely to cite it as proof that Cuba is either a flagrant violator of human rights or the victim of U.S. policies which, in turn, violate Cubans' human rights. Bush administration officials and anti-Castro activists maintain that Cuba's lack of economic and political freedoms are the root of such desperate acts. Cuba responds that similarly risky attempts to reach the United States by Mexicans, Haitians, and other Latin Americans are proof of the injustice of U.S. immigration policy and faults the 40-year old U.S. embargo for simultaneously undermining the Cuban economy and encouraging emigration northward.